The former space of chef Mark Peel'sCampanile is being turned into Republique, a project from restaurateur Bill Chait (Rivera, Sotto, Picca, Short Order) and chef Walter Manzke. Republique, 624 S. La Brea Ave., Los Angeles, CA 90036, no phone. The Anaya brothers have opened a branch of Pinches Tacos in Larchmont Village. Tacos, burritos, sopes, tortas and enchiladas are all represented on the menu, and family recipes are the inspiration for homemade salsas, mole sauce and carne asada marinades. There are also a few selections of "not authentic Mexican food" including a hard shell corn tortilla filled with shredded beef, cheese, lettuce, tomato and chipotle cream. 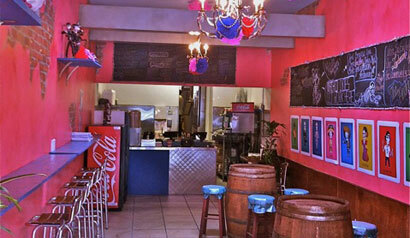 Pinches Tacos, 203 N. Larchmont Blvd., Los Angeles, CA 90004, 213-281-5471. A new Indian fusion spot in Hollywood, Spice Hollywood Bistro, is serving up savory dishes on its patio, including vegetarian flatbreads, chana masala wrap, Punjab tikka sliders, Mumbai masala wings, and desserts like guava mango cheesecake. There's a full bar with specialty cocktails, and Friday and Saturday it's open until 4 a.m. Lunch daily; Dinner Mon.-Sat. Spice Hollywood Bistro, 1644 N. Cahuenga Blvd., Hollywood, CA 90028, 323-572-4646. In West Hollywood, V. Wine Room is now pouring boutique California wines, as well as specialty beers. Bites include berries with champagne and vinegar; Buffalo mozzarella with basil oil; puff pastry with beef; and a variety of pastries. Lunch & Dinner daily. V. Wine Room, 903 Westbourne Dr., West Hollywood, CA 90069, 310-339-9202. In Redondo Beach, Meg Hall's tiny new Made by Meg café has opened with a menu of gourmet sandwiches, salads and plates, including grilled asparagus with scallions, burrata and dandelion greens, a Black Forest ham panini with grilled pears and shaved Parmesan, and grilled steak with chile glaze and Tahitian vanilla bean sweet potatoes. Lunch and Dinner Mon.-Sat. Made by Meg, 234 S. Pacific Coast Highway, Redondo Beach, CA 90277, 310-999-8770. A new cutting-edge Latin restaurant has opened in Bell called Corazón y Miel, with former Animal chef Eduardo Ruiz creatively helming the stoves, and mixologist Christian Pulido shaking up craft cocktails. Dishes include pig skin two ways, crispy chicken feet with poblano dumplings, mushroom mole with hominy, mescal-marinated flank steak, and a Salvadorean whole turkey leg sandwich. Lunch Mon.-Fri., Dinner nightly. Corazón y Miel, 6626 Atlantic Ave., Bell, CA 90201, 323-560-1776. The Lettuce Entertainment Group and Stella Rossa Pizza Bar chef Jeff Mahin have opened Stella Barra in the former BoHo space next to the Arclight on Sunset. Mahin's market-driven, Cal-Italian menu features big salads, pizzas, sandwiches and house-made pastas, as well as larger plates. A sprawling bar anchors the dining room, with a cocktail menu created by Proprietors LLC and an expansive wine list. Stella Barra, 6372 W. Sunset Blvd., Los Angeles, CA 90028, 323-301-4001. An airy new two-story eatery/bar/artisan coffee shop/bike shop in Calabasas has opened called Pedalers Fork. There's creekside outdoor dining, while inside the décor includes antique fixtures, reclaimed wood and vintage bicycles. Chef Dan Murray offers a contemporary California menu for breakfast, lunch and dinner with all local-grown ingredients featuring flatbread with wild boar sausage, miso-glazed black cod, and many vegan and vegetarian choices. Marcos Tello and Aidan Demarest (Seven Grand, The Edison), have created a knockout cocktail list. Breakfast, Lunch & Dinner daily. Pedalers Fork, 23504 Calabasas Rd., Calabasas, CA 91302, 818-225-8231. Umami Restaurant Group will open Roadhouse L.A. this summer at the Improv in Hollywood. Chef Robbie Richter (New York's Hill Country and Fatty ‘Cue) will create an upscale global barbeque menu with dishes like smoked lamb neck, jerk chicken and short rib fajitas, and poutine with curried goat. Roadhouse L.A., 8162 Melrose Ave., Hollywood, CA 90046, 323-651-2583. Chef Suzanne Goin and Caroline Styne (Lucques, A.O.C., Tavern and The Larder at Maple Drive) opened The Larder at Burton Way on April 22, 2013, at developer Rick Caruso's new luxury residential development at the gateway to Beverly Hills, 8500 Burton Way. It offers breakfast, lunch and dinner daily, including takeaway and delivery throughout the BeverlyHills area. The Larder at Burton Way, 8500 Burton Wy., Los Angeles, CA 90048, 310-278-8060. Kazunori Nozawa's SUGARFISH has opened its sixth location in Beverly Hills. Expect the chef's three famous "trust me" prix-fixe menus along with à la carte choices of sushi, sashimi, hand rolls, plus sake, beer and wine. Lunch & Dinner daily. SUGARFISH, 212 N. Canon Dr., Beverly Hills, CA 90210, 310 276-6900. The popular Israeli burger chain Burgerim has launched its first U.S. location on Santa Monica Boulevard in West Hollywood. Expect three-inch burgers made with Kobe-style beef, merguez, lamb, ahi tuna, turkey, and veggies, with toppings like harissa and tahini. Israeli salad and onion rings round out the menu. Lunch & Dinner daily. Burgerim, 8593 Santa Monica Blvd., West Hollywood, CA 90069, 310-854-0234. Real Housewives of Beverly Hills star Lisa Vanderpump (Sur Restaurant) will open a new venue called P.U.M.P. Lounge in West Hollywood. It's currently under construction with no opening date set. P.U.M.P. Lounge, 8948 Santa Monica Blvd., West Hollywood, CA 90069, no phone. M.B. Post chef-owner David LeFevre's has opened Manhattan Beach seafood restaurant Fishing With Dynamite. The former Water Grill chef revisits the East Coast fishing nostalgia of his childhood with a raw bar menu including oysters, crab and sea urchin, as well as cooked seafood such as miso Alaskan black cod with gingered eggplant and Thai basil. Fishing With Dynamite, 1148 Manhattan Ave., Manhattan Beach, CA 90266, 310-893-6299. TINGA Santa Monica has opened in the former space of Renee's Courtyard Café in Santa Monica. The restaurant features Mexican fare, such as the signature tacos with chipotle steeped shredded chicken, shredded lettuce, crema and pickled red onions, plus handcrafted cocktails by Joel Black (Comme Ca). TINGA Santa Monica, 522 Wilshire Blvd., Santa Monica, CA 90401, 310-451-9341. Allumette has opened in the former Allston Yacht Space in Echo Park. Expect an eclectic menu with dishes including pink snapper crudo, fried oyster with kimchi ranch dressing, Szechuan pork dumplings, short rib cooked in pho, boneless whole sea bream for two and cheesecake mousse. Allumette, 1320 Echo Park Ave., Los Angeles, CA 90026, 213-935-8787. Eastside restaurateur Baba Ji (Cowboys & Turbans) turned his hipster juice bar Silverlake Juiceinto the Sprouted Garden Café. The cleansing juices will stay, and are joined by chef Aline Fiuza's Ayurvedic menu including kelp noodles with pesto, raw green curry avocado soup, a tofu mushroom burger, vegan quiche and many fancy salads. There's an organic beer garden, too. Sprouted Garden Café, 2813 Sunset Blvd., Los Angeles, CA 90026, no phone. Three's a charm for chef Josef Centeno, who's following up his successes downtown with Bäco Mercat and Bar Amá with an Italian small plates eatery called Orsa & Winston, next door to Bar Amá in the space of a former pizza joint. Expect a late summer/early fall opening. Orsa & Winston, 122 W 4th St., Los Angeles, CA 90013, no phone. At the Metlox Plaza in Manhattan Beach, Thierry Perez (Fraiche, L'Epicerie Market) has opened the sprawling Chez Soi with Mark Gold (Eva) helming the stoves. Expect a New American menu with dishes including burrata with charred "sprouting" broccoli; roasted Maine lobster with fava beans; and wild duck with toasted buckwheat, plum and "puffed" kale. Beachgoers will appreciate the patio and classic cocktail menu, as well as weekend brunch. Dinner nightly, Brunch Sat.-Sun. Chez Soi, Metlox Plaza, 451 Manhattan Beach Blvd., Manhattan Beach, CA 90266, 310-802-1212. Silver Lake hipsters have a new breakfast/lunch haunt at Sqirl, a tiny eatery at Virgil and Melrose. Chef/owner Jessica Koslow (who's done a stint at Bacchanalia in Atlanta) is a local cult jam maker who now offers her canned summery goodness (blueberry with thyme, Santa Rosa plum chutney) on toast, as well as items like fried eggs with greens and tomatillos on brioche, and pork sausage salad. Breakfast & Lunch Thu.-Tues. Sqirl, 720 North Virgil Ave. #4, Los Angeles, CA 90029, 213-394-6526. Jon Shook and Vinny Dotolo (Animal, Son of a Gun) have teamed up with Ludo Lefebvre (LudoBites) on a new restaurant called Trois Mec. In lieu of traditional reservations, meals must be paid for in advance on the restaurant's web site. The five-course prix-fixe menu costs $75, excluding tax and a service charge. Trois Mec, 716 N. Highland Ave., Los Angeles, CA 90038, no phone. B Grill by BOA Steakhouse, a more casual spin-off of Innovative Dining Group's modern steakhouses in West Hollywood and Santa Monica, has opened in Terminal 7 at LAX. B Grill by BOA Steakhouse, Los Angeles International Airport, 700 World Way, Terminal 7, Los Angeles, CA 90045, 310-646-5252. The Strand House is hosting a recipe contest for the best Mother's Day brunch dish. Recipe submissions will be accepted on the restaurant's Facebook page until May 7, 2013. The dish will be featured on the brunch menu at The Strand House and the winner will receive complimentary brunch for four. The Strand House, 117 Manhattan Beach Blvd., Manhattan Beach, CA 90266, 310-545-7470. West Hollywood's Tortilla Republic hosts weekly pop-up dinners on Thursdays starting at 5 p.m. at Taste at the Palisades. On offer are soju margaritas and a rotating menu of Tortilla Republic's signature dishes, such as duck confit tacos with sour cherry salsita, shaved radish and cilantro crema. Taste at the Palisades, 538 Palisades Dr., Pacific Palisades, CA 90272, 310-459-9808. A closing date of July 14, 2013, has been set for the Las Vegas location of Valentino, which will end the 14-year residency of chef Luciano Pellegrini. Owner Piero Selvaggio said The Venetian decided not to renew his lease this summer. Valentino, The Venetian, 3355 Las Vegas Blvd. S., Las Vegas, NV 89109, 702-414-3000. 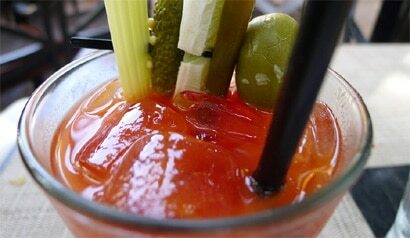 Wilshire Restaurant in Santa Monica has launched a new Sunday brunch available from 11 a.m.-3 p.m. It features a buffet of salads, appetizers, pastries and desserts, plus an omelet station and an unlimited mimosa and Bloody Mary bar. The cost for the Sunday brunch buffet is $35 (not including tax or gratuity) for adults and $25 for children under 12 years of age. Read more on GAYOT's blog. Wilshire Restaurant, 2454 Wilshire Blvd., Santa Monica, CA 90403, 310-586-1707. Michael Wilson has assumed executive chef duties at Santa Monica's 31Ten Lounge. Wilson formerly oversaw the kitchens of 5 Dudley in Venice and Wilson in Culver City. Look for a creative menu of elevated comfort food with global touches. 31Ten Lounge, 3110 Main St., Santa Monica, CA 90405, 310-450-5522. The romantic downtown restaurant Kitchen Table has closed less than a year after opening. Kitchen Table, 410 S. Main St., Los Angeles, CA 90013, no phone. Unluckily for West L.A., Roy Choi (A-Frame, Sunny Spot, Kogi Korean BBQ-To-Go) has closed Chego on Overland Avenue. But luckily for Eastsiders, he's relocating Chego to Chinatown's Far East Plaza, with plans to open at the beginning of May --- with some new menu items to boot. Chego, 727 N. Broadway, Los Angeles, CA 90012, no phone.